It really all does boil down to personal preference, since whichever school you choose, you can be confident that you’ll get a good education. All three schools are recognized by NCFMEA as being on par with US med schools in terms of accreditation, and have the educational and administrative standards high enough to qualify for US federal student loans. They all have facilities like anatomy lab, computer labs with virtual imaging software, Sim Man, Harvey Cardiac simulator, computer-based testing, access to Up-To-Date and other electronic medical resources, group-learning facilities, etc. They all have very high USMLE first time pass rates, comparable with US med schools, showing they all prepare you well for the USMLE. Although these fields are competitive, both for US med students and Caribbean med students alike, Ross, SGU, and AUC all have histories of matching students into Anesthesiology, Surgery, Pathology, and Radiology year after year. I chose AUC because of the smaller class size, MUCH more developed island (which is very important considering I’ll be living nearly 2 years of my life here), and closer-knit school community, and so far I’m very happy with my decision. I’m quite impressed by the support we get from professors and fellow students alike. I’m also impressed by how everything at AUC is so student-driven, from school-wide events, to community service initiatives, to even the hiring of new faculty (which the school encourages students to actively evaluate). What is the structure of the curriculum? In terms of curriculum, AUC, Ross, and SGU will all teach you the standard material needed for a strong foundation in medicine. However, their approach is different. AUC has a traditional discipline-based curriculum to teaching medicine, meaning you’ll take classes like Anatomy, Physiology, Pathology, Pharmacology, etc. You’ll learn about the different organ systems within each discipline, like when you take physiology, you learn about renal physiology, GI physiology, cardiovascular physiology, etc. Ross University has a system-based curriculum, with classes based on organ systems, so you’ll take classes like Digestive System, Renal System, or Cardiovascular System. You’ll learn about the different disciplines within each organ system-based class, like when you take the Digestive System class, you learn about the histology, physiology, pharmacology, pathology of the digestive system. 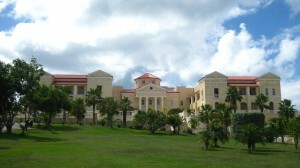 SGU’s curriculum is similar to AUC’s in that it is discipline-based. However, their classes focus a lot on cases, and so students attend small group discussions on clinical cases in addition to their class lectures for many, if not most, of their classes. How many exams do you have per semester? This can be a very important determinant on how well you can manage your grades. For example, at SGU, a student’s final grade in a class is dependent mainly on two exams: the midterm and the final exam. Classes may have short quizzes as well, but these typically don’t count nearly as much as the two exams. Having two main exams that determine your grade can make students very stressed as they have longer semesters and more material to cover for each exam. At AUC, in contrast, classes typically have 4 exams each, followed by a comprehensive final exam. As AUC is based on a trimester system, the semesters are shorter and the amount of material you need to study for exams are much more manageable. At Ross, classes typically have 3 exams (or “minis” as they call them at Ross) each, plus a comprehensive final exam for the class. There are also anatomy and histology practical exams at all three schools, which may or may not count as “part of” the main exams. At Ross, SGU, and AUC, exam questions are all USMLE-style, and so taking more exams means not only more ways to “prove yourself” in a class but also more practice for the USMLE. Also of note are NBME exams, created by the National Board of Medical Examiners (NBME), the same organization that sponsors the USMLE. These exams are taken by students at US med schools and scored nationally, and are excellent ways to gauge your academic progress on the national level, not to mention great practice opportunities for the USMLE. Students at AUC, Ross, and SGU all take the NBME Comprehensive Exam at the end of Basic Sciences as well as the NBME Clinical Subject Exams during clinical rotations. However during Basic Sciences, Ross University does not offer any of the NBME Subject Exams (at least during the time of this writing), whereas SGU offers NBME Subject Exam in pathophysiology, and AUC offers students all of the NBME Subject Exams. If you decide to AUC, I highly recommend taking full advantage in taking these NBME shelf exams, as it is rare for a Caribbean school to even offer them. How is the anatomy lab run? Anatomy is a very important class and the knowledge you gain will help you in future classes, and so it is important to learn it well, and the best way to learn it is from real cadavers. I would contact the school to find out how much contact you have with the cadavers. Do you have the opportunity to dissect, or are they already dissected for you? How many students are there per cadaver? How much lab time do you have? Are there ample TAs in the lab that will aid you in your learning process? In 2010, a friend of mine from SGU told me that at SGU, there are 15 cadavers shared between the nearly 400 students in his class. At AUC, however, there were 18 bodies (19 if you include the TA demonstration body) for 208 students, giving students much more contact with the cadavers. At SGU, all the bodies were already prosected (pre-dissected), whereas at AUC, students personally perform the dissections. To me, this made anatomy a much more enriching experience as I connected with my “first patient.” At SGU, students are required to go into anatomy lab 2 times a week, 30 minutes each (but labs are open after hours as well). At AUC, students go into lab usually 4 times a week (and sometimes 5, depending on the week), 2 hours each time. At AUC, the lab is also open after hours for self study. I’m not sure how the labs are run at Ross, but again, it’s worth finding out. Is there a safety net? Although we all hope that we will succeed in our medical studies, we need to know if there’s some sort of safety net in case academics don’t work out as we wanted. It’s not something easy to think about but it is important. One policy to consider is what does the school do if you fail classes. At Ross, if you fail a class, you’ll have to retake the entire semester as well as take an additional class on study skills, even if you excelled the other classes. This is not so at AUC where you just retake the one class you didn’t do well in and try again. At SGU, if you fail a class that has less than 4 credit hours, you’ll be asked to take a make-up exam. If you fail a class that has more than 4 credit hours, you automatically get dismissed from the school. AUC, SGU, Ross, and Saba all have different grading scales. A passing grade at AUC is a 70%. At Ross, the passing grade varies between 55-65%, depending on how the rest of the class does for an exam. At SGU, although passing grade is a 70%, you will be put on academic probation if you have a cumulative average of 73%. Saba has the highest passing grade, at 75%. Any grade below 75% is considered failure. The rules for dismissal are also different at each school. At AUC, you may fail up to 17 credit hours before getting asked to leave. After this, students have the opportunity to appeal in front of a committee consisting of faculty and honor students who will decide whether or not to allow the student to stay. At SGU, on the other hand, you will be dismissed after failing a 4 credit course, or two courses that are less than 4 credits each. At Ross, you will be dismissed after repeating a semester twice. How do students end up doing on the USMLE? What matters at the end of the Basic Sciences portion of medical school is whether or not students pass the USMLE Step 1, and AUC, Ross, and SGU all have high first-time pass rates, on par with those found at US allopathic medical schools. The pass rates at each school changes year-to-year, but from my personal observation over the last few years, they all hover around the same range. AUC’s USMLE Step 1 first time pass rate in 2012 was 96%, while SGU’s was 97%, and Ross’ was 96%. In comparison, the USMLE Step 1 first time pass rate at US/Canadian schools in 2012 was 96%, while for DO schools it was 92%, and for overall international medical schools it was 76%. For more about Step I scores, check out this post. So in conclusion, there are lots to consider. Knowing successful graduates from all three schools, I don’t believe there are any one school among the three that is better than the other. They all provide students opportunities to become physicians, and whichever one you choose boils down to personal preference. It’s important to read multiple students’ experiences, since everyone may give a different perspective. Feel free to check out the blog links I have at http://www.caribbeanmedstudent.com/other-blogs . I’ve put asterisks by my recommendations. My First Shelf Exam! Always Carry Your Notes With You! 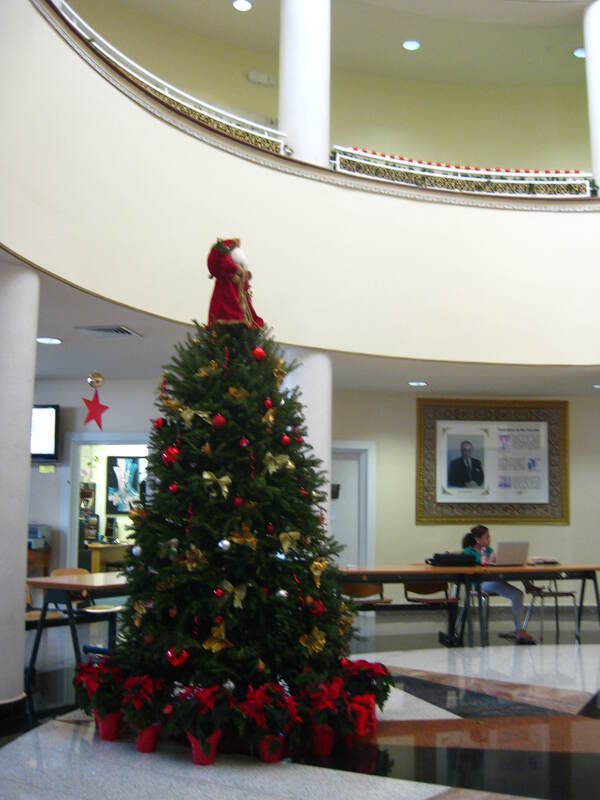 Study Tips for First Semester Common Questions About AUC Classes It’s Beginning to Look a Lot Like Christmas! Just wanted to drop a word to say a big, “Thanks!” for these guides. I’m heading to AUC in the fall, and since it will be my first time out of the country, I’ve been worried sick. Some of the things you have here really help. Can I ask you a question? Does anyone ever go grocery shopping (i.e. really load up) using those buses/minivans? It doesn’t look like grocery stores and Cost-U-Less are in walking distance. Thanks! And thanks for keeping such a helpful blog/diary! Thanks for the message, and sorry for the late reply since I’ve been really busy lately. Although I have heard of people riding on the buses to go grocery shopping, I wouldn’t recommend it especially if you plan on buying more than you can carry with your two hands. I usually rent a car and split the cost among a few friends and go shopping together. That way, we can visit many grocery stores if we want to and still fill up the entire car with groceries. There is also Gourmet Marche within walking distance of campus that I often go to. It has pretty much most things you need and prices are for the most part comparable to the big Grande Marche in Philipsburg or Cole Bay. By the time you get here, they will probably be close to finishing building the Blue Mall down the street from campus. They plan on opening a grocery store there called US Imports as well. Thank you for the blog, veryvery helpful. I got accepted to both AUC and SGU. and I can’t decide which one to go. I am really desperate. Hi Benji-I’ve been a long time reader of your blog and have really enjoyed it! I’m actually headed to medical school in the fall but have kept up with what’s going on in the Caribbean for quite some time. I always look at the match lists whenever they are published and have never seen someone from the Caribbean match into derm or plastics. I have absolutely nothing against the Caribbean schools and have a lot of respect for all of you guys. I was just wondering where you found that Ross and AUC students had matched into those specialties. Please point me in the right direction if you get a chance! Thanks! i love your site and it has given me great insight as to what i should anticipate when starting med school this fall. my concern was with the fact that you talk about SGU, ROSS, and AUC but you rarely mention (or compare) Saba. Why is that? Thanks for the concern. I mentioned mainly AUC, Ross, and SGU because I originally wrote this post as an answer to an email question I got from a blog reader who was mainly interested in these schools. To read about my visit to Saba University last year, please check out this: http://www.caribbeanmedstudent.com/2010/12/expedition-to-saba/ . i would hate to invest so much in med-school and not match at all–thats my fear. First of all, no school can guarantee you a match, not even a US medical school. Whether or not you will match will depend on how strong your application, scores, recommendations, and interviews are as an individual. If you check out the school’s match list (http://aucmed.edu/alumni/past-residencies.html), you’ll see that every year, there are plenty of students who match in Internal Medicine, and several who match in General Surgery as well. I’m not sure what the match rate is, but most AUC graduates do match somewhere. I’d suggest contacting the school to get an update on these numbers. If anyone is interested in a SGU persepctive, a great student blog by a skilled writer is shahblahblah.wordpress.com! Great blog!!! Just a quick question: So is heineken cheaper on the Dutch side? Hey Benji! I’ve been looking at your blog and browsing through for a couple of weeks. I’ve always wanted to go to AUC, since 2008. And am finally applying for September 2012. My question is, compared to SGU, AUC is year round. Is this because there is a less of a courseload (SGU classes spread out between 2 semesters, AUC spread out between 3)? I guess what I mean is, lets say, the avg. medical student takes 10 classes in one school year, for SGU it would be 5 in semester 1, 5 in semester 2, the summer. For AUC, would it be 3 in semester 1, 3 in semester 2, 4 in semester 3? That’s a good question, and something I’d clarify with the schools. However, just from what I see from SGU’s curriculum and AUC’s curriculum, it seems like both schools complete Basic Sciences within 5 terms and within the similar time periods. The two schools just distribute the breaks a little differently. AUC has a break between each of its five terms: about 3 weeks for the winter holidays, and about 2 weeks for the summer and fall breaks. According to valuemd, however, SGU has a 3.5 week break for winter, a 1.5 month break during summer (if you start in September class), and no break between terms 3 and 4. It’s common in both schools for students to take a few months off to take the step, and start clinical rotations the semester after term 5. If you calculate the number of credit hours during Basic Sciences for the two schools, SGU students complete 84 credits within 5 terms while AUC students complete 89 credits within 5 terms. Hope this helps! Again, I’d verify with the school, as I’ve only experienced the curriculum at AUC. Do you know the numbers I would need to get in to AUC? My freshman year brought my GPA down and it’s been hard to bring it up ever since then. Also one of my friends goes to SGU and he said that they try really hard to fail you and weed you out. Is that true with AUC? My friend who went to SABA said the same thing. I think it really depends. I know people who get into AUC with 24 MCAT and 3.2 GPA. I personally got in with 28 MCAT 3.5 GPA. I think if you get scores around this or higher, you’ll get in. I think you won’t really know until you apply, so I’d still go ahead and apply! Remember, a high MCAT can make up for a low GPA (to a certain extent), and vice versa. Also remember, medical school is supposed to be challenging no matter where you go, whether it’s in the US or at the top Caribbean schools. Any good school that prepares you well will be challenging. From my experience at AUC, the workload and exams definitely are challenging, but I really don’t think the school makes them difficult simply because they want to fail students. Actually, I don’t think it’s in any school’s best interest to weed students out. Rather, I think they do so to prepare us for greater challenges in the future, like our board exams, residency, and not to mention, our lives as doctors, which we’ll be dealing with challenges everyday. The professors and administrators here have been truly supportive in wanting to see us succeed, and as a school, more and more of us do every year. In fact, our current USMLE Step 1 first time pass rate is 94%, which is comparable to US medical schools. Compare this with our previous pass rate of 57% in 2003, just nearly a decade ago! From my experiences as a student, the professors welcome students to office hours, are great at holding reviews outside of class, and the school has tutors, resources, a study skills advisor, and even wellness counselor who holds stress management workshops. The majority of students that come to AUC do succeed. The last I heard, our attrition is something like 13%, give or take, but I’d contact the school with more updated info. Remember that med school is doable, but requires lots of discipline and hard work. A Big thanks to you Ben for all the information about top 4 schools in Caribbean. I stumbled upon this Caribbean school (University of Health Sciences Antiqua). Their website reflects lot of hospital affiliations. What is your opinion on this school? I haven’t seen you mentioning about this school in your blog. Any information would be greatly appreciated. Hi there, thanks for the great blog! I’m interested in the testing protocol at AUC. You said theres typically four tests per class and then a final exam correct? Also how many classes does a student take at one time? (So I can gauge the number of tests per semester). Hey Jeff, thanks for visiting! We usually take 3 classes at a time most semesters. Sometimes you’ll have extra classes here and there that don’t last an entire semester as well. My question is How was your experience in preparing for the mcat exams ? The MCAT felt like ages ago.. I took the Kaplan MCAT prep course. I thought it was helpful but a lot of things to cover. It’s helpful if you can keep up. Thanks Helen! I wish you the best in your med school applications! Benji great blog !!! I am a Chiropractor who is considering returning to school. 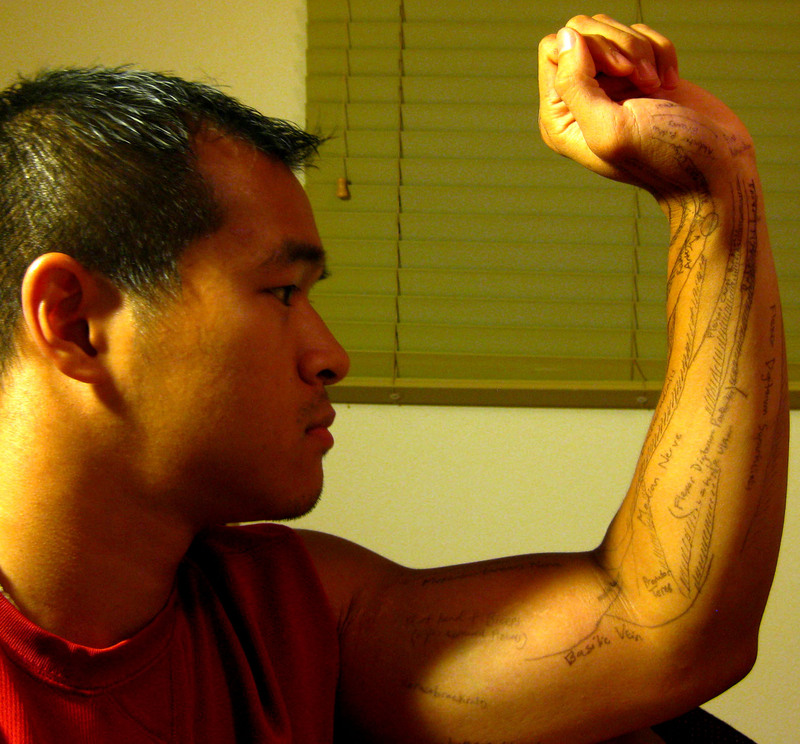 I practiced for almost ten years before developing a career changing disability with my wrists and hands due to the nature of the profession. I had a Chiropractor working for me for several years but it did not work out so I had to close my practice. I have always loved people and taking care of them, I miss making a difference in peoples lives and want to contribute any way I can. A career in medicine seems like a natural move for me but I am not certain if I have the pre requisites to get into medical school. AUC sounds like a great place and I have friends that have homes on the island. Do you know of anyone with a similar situation, any guidance would be of great help towards taking my first steps back, thank you. There are certainly many people who have worked many years in one career and decide to go to medical school. I’ve had classmates who were former PAs, nurses, lawyers, researchers. Some classmates even already have their PhDs. I have classmates in their 40s and even 50s, and many of them are very disciplined and focused and do very well. As for pre-requisites, AUC require many of the same pre-requisites as US medical schools, like pre-med classes (2 semesters bio+lab, 2 semesters inorganic chem + lab, 2 semesters organic chem + lab, 2 semesters physics + lab, english, and a few upper level biology classes may help), and MCAT. I’m sure you can find a lot of the pre-req information on the AUC website. Best of luck to you Jon and thanks for visiting my blog. I really enjoyed reading your post. Anyway, I’m looking into applying to SGU, AUC, Ross, Saba and AUA for the January semester(which btw I heard is much easier to get into). I will be writing my MCATs in August but so far I have been scoring around 29-32 with kaplan test prep. My undergrad cGPA is 3.31 for the first school I attended and 3.83 after transferring. My sGPA is 3.45. My question is what do you think my chances are for getting into one of the big 4? I have leadership experience, research, I did a summer at Yale SOM, I have tons of shadowing experience and I worked in a Lab for a few years during undergrad. I think if you continue doing what you are doing on the Kaplan test preps and maintain your GPA as it is, you have a very good chance of getting in the Big 4. Best of luck! Benji, thanks for your insight. I am considering SABA. After investigation, it looks like most people consider AUC and Ross to be better options. Is there a reason for this? I’m not really sure if this is true, and if it is, I don’t know the answer to that. The island of Saba is also only 5 square miles so amenities are limited there, and many people may find life to be difficult to adjust to there. I know a few students at AUC who transferred from Saba, and from what I hear from them, they thought the student support and education at AUC is much better than Saba. However, tuition is cheaper at Saba than at AUC, and both schools offer federal student loans to US students. Since I am not a Saba student, I don’t feel like I can say much about this. Hope this helps. Best of luck! I’ve heard that Ross students have difficulty during clinical rotations because SGU is buying out most of the spots for their students. Is this true? Does AUC have an issue with students getting into a clinical rotation of their choice or do they have sufficient hospitals for the students to do their rotations? Since there are limited rotation spots at each site, and the choice of hospital is determined by a first-come-first-serve basis, it’s not guaranteed that you’ll get the rotation spot of your choice. This is true for SGU and Ross as well. However, from my experience, there is always an AUC-affiliated hospital somewhere where you can do rotations. Personally, I’d recommend doing rotations at multiple locations. This way, you can make connections at different hospitals (each hospital you rotate at is a potential place to do residency), and academically, you can experience how different hospital systems work. Thank you so much for all the valuable information you have posted. I am currently licensed in California, but had a great offer in Oregon. I searched high and low to find an approved list of foreign medical schools that the oregon board accepted for licensure, all in vain. Finally after weeks of wondering if I can take this fabulous new job, I found your site, and found my answer right away! Thank you so very much!!!!! I cant tell you how relieved I am, and am so grateful to you Benji! Wish you all the best. I’ve been reading through alot of your posts and theyre very helpful. I’m seriously considering SGU and AUC.. it seems like I’m leaning toward AUC. I’m wondering if SGU has a higher placement percentage than AUC. I’ve been searching and they dont post out of their class what percentage actually gets residency, they only break down the percentage into specialties. AUC does post this and their match is 81.7% for 2013. I’m wondering if you have any thoughts on the matter. Thanks for reading my blog! I’m not sure what the match rate at SGU is, but my guess is that it would probably be about the same as AUC. What it really boils down to is how you do as a student. If you perform well on your exams, get good clinical grades and comments, then you’ll do better in the match, no matter which school (AUC or SGU) you went to. Hi Dr. Benji, i am very impressed with your site. You have put a lot of work into this man, thank you! I recently got accepted into the Sept. 2014 incoming class, but i still got my doubts whether i should matriculate or not. I know that AUC is a solid American school in the Caribbean, fully accredited and expanding. I heard about the new buildings and the campus improvement plan which will make the school even more competitive and it shows that it is financially and academically stable. So there is no question about that, however, i keep getting all this info saying that getting a residency spot will become almost impossible for IMGs because US schools are expanding quickly to fill up the gap or demand for future doctors. I feel like there is a race and that US med school are stepping it up to the point they could possibly overshadow IMGs and kick us out. Now, do you know of any quantitative or statistical evidence that shows that getting a residency will become much harder in the future (2-3 yrs from now)? If so, should i reapply to a US school. Here are my stats: GPA 3.4, MCAT 27 (8P, 8V, 11B), 2 shadowing internships, 1.5 years of chemistry research, 1000+ community service hrs, a pre-health committee very highly recommended status and strong letters of recommendations. Thanks J. Vera, and congratulations on your acceptance into AUC! You pose a very good question, something that we IMGs have to think about. It is true that US medical schools are expanding enrollment. Since 2005, US schools have increased enrollment 1.5-3% every year. US med schools enrolled 287 more students in 2012 than they did in 2011, and 538 more in 2013 than 2012. See page 4 of this link. However, at the same time, residency spots available in the Main Match have also been steadily increasing. 612 more residency spots were added in 2011 (total 23,421). 613 more residency positions were added in 2012 (total 24,034). 2358 more residency positions were added in 2013 (total 26,392). See page 26 of this link). The sudden increase in number of residency positions in the Main Match in 2013 was probably due to the implementation of the “All-In Policy” in which residency programs have to either fill all their available positions through the Match or fill all their positions via Pre-Match (which is only available to IMGs). The result is that many of the programs that used to do half Main Match and half Pre-Match decided to fill all of their positions through the Match, while a minority of other residency programs may have withdrawn completely from participating in the Main Match and do Pre-Match exclusively to fill their residency positions. While it is great that there are more positions in the Main Match, it also means there are less positions for IMGs who may want to Pre-Match. So given the statistics, while med school enrollment is increasing (both in the US and in the Caribbean), the number of residency positions are also increasing at the same time according to the data published by NRMP and AAMC in the links above. While I don’t think it will be impossible for IMGs to match, I think it’s hard to say now what the future will be like for IMGs. There may be other confounding factors that I’m not thinking of, and GME funding and policies may change within the next few years. But given the statistical trends I see for the past few years, I think (and I hope) there won’t be any drastic changes in the matching chances of IMGs in the next few years. I love the feedback on this but I am wondering about the facilities of ross which I have heard are very poor. Can anybody elaborate on the differences on each school’s facilities. ross, auc, sgu etc.? The facilities at the Big 4 schools all pass the same accreditation standards, as put forth by the NCFMEA (of the US Department of Education). I’ve personally been to the facilities at Ross, and they are not poor. Their simulation lab facilities and classroom resources are updated and advanced. AUC also recently built a new building on campus with updated facilities. First off, I have stumbled upon your blog very recently and I am so grateful that I did. I have learned so much from your writing and a lot of is very encouraging. I am considering applying to SGU, AUC, and Ross. I was wondering, when do applicants apply for AUC admission in May and for August? I was thinking of waiting until March to apply but I am afraid that it will be too late, especially since the schools stress that seats do fill up. Also, my mcat is 29 and my gpa is 3.0-3.1, which is a little lower than the average of admitted students and I am worried that it may not be good enough. I do have a lot of volunteer, research, and shadowing experience as well as an EMT certification. I know it is difficult to answer these questions especially since each case is unique and situational, but I would really appreciate your opinion!! Thanks so much!! Glad you found my blog helpful! I would say applying earlier is always better. Why wait until March if you can apply now? Although your GPA is lower than the average at AUC, your MCAT is higher. I think you would still get invited for an interview, but you would have to explain why your GPA is what it is. Also, AUC would consider the extracurriculars that you have done and consider any personality characteristics that you may have. Of course, you won’t know until you apply, so I would say go ahead and apply! Best of luck! I really appreciate your blog and I’m happy about all your success! I’ve been accepted into both AUC and Ross and I’m in the process of debating where I will go. After reading many of your posts, I was hoping you could answer a few questions! 1) Now that you are a resident, do you feel as though you are looked down upon in any way for the name of the school where you received your medical degree? If so, do you think it would be different if you had gone to Ross or SGU instead? 2) From my understanding, AUC has a 5th semester on the island which means another semester of tuition, rent, and living costs. Does that make a huge difference financially in terms of paying back loans? 3) Lastly, I also will be in a long distance relationship while in school. I’ve seen that AUC is closest and has direct/more frequent flights to the states. Was this all that helpful for you and your now wife? And how were you two (as students) able to afford the flights/vacations? Congratulations on your acceptance to med school! Whichever school you choose, there will be opportunities open for you. Both schools have some strong residency placements this year. Check out AUC’s: http://aucmed.edu/alumni/residency-placement/2015-residency-placements.aspx. Now that I am a resident, I do not in any way feel looked down upon from the school I received my education. My colleagues include both US grads and IMGs, and we are all the same. What matters most now is how I do now going forward as a resident physician. Most Caribbean schools have a fifth semester, including both AUC and Ross. I don’t imagine there being a huge difference between Ross and AUC’s fifth semesters in terms of living costs. St. Maarten is expensive, but so is South Florida, where Ross has its fifth semester. My wife and I visited each other during every break between semesters that we had. I would either fly there or she would fly down to the island. My federal student loans was more than enough to pay for the cost of travel. It worked out well. I’ve recently been accepted to SGU for this August and I’ve heard that they secure a certain number of hospitals such that their students can complete their clinical rotations. I’ve come across this blog and I do like how the exams at AUC are more spread out and that the class sizes are much smaller. However, I fear that I may not be able find clinical rotations. How does AUC aid their students in terms of finding clinical rotations? How did you find the process? Also, when did you start your program at AUC? I heard that theres three possible start positions: Sept, Jan and May. Is it true that if one starts AUC, SGU or ROSS in January they’ll most likely miss the previous year’s Residency Match? Do you know of people who were in such situation when you were at AUC? Also does starting in May just mean more time to prepare for the next year’s match? By the way thanks for the wealth of information on your blog!